The simplest graphs to master are straight line graphs. Every straight line can be drawn using just two points, or a point and a gradient. These two bits of information can be found in a variety of ways and your first task is to learn how. You will learn to recognise the equations that produce straight lines. They contain an x and/or a y term and some numbers, but nothing else, nothing fancy … no xy terms or powers or radicals or other functions … just a simple x and/or y term. Two examples are on the graph at left. Such equations are called linear equations. You will learn that linear equations come in a variety of forms, depending on the positions of the terms relative to the = sign. 2x – 3y + 6 = 0 is in the General Form, 2x – 3y = -6 is in the Standard Form, y = 2x + 7 is in the Gradient-Intercept Form, and x/4 – y/3 = 1 is in the Intercept Form. These are the main forms for linear equations. You will likely concentrate on the General Form and Gradient-Intercept Form during your schooling. Once you have learned to graph lines using each of these forms, you will then learn to calculate the equations for parallel and perpendicular lines, calculate where lines will intersect (see image at left), and calculate the distance from a point to a line. This is quite a body of skills to master, but I encourage you to practise until you find this work almost intuitive. All your ‘straight line’ skills will form a foundation for other curve sketching skills, for the fundamentals of calculus, and for learning about sequences and series and other mathematical matters. So often, we make calculations more difficult than they need be. This is very true of the way in which we find the equations of lines parallel to a given line through some given point. 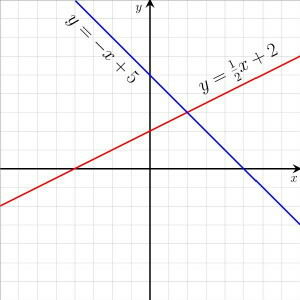 So that students understand that the two parallel lines will have the same gradient, we teach them to rearrange a linear equation into the gradient-intercept form first ... and then (often) convert it back to some other form at the end of the process. This 'double conversion' is useful in driving home the principle that parallel lines have identical gradients, but it is terribly wasteful and inefficient if you simply want to find the final equation! In this video I show you how to identify where the gradient's information is 'stored' in a linear equation. I then show you how to use that knowledge to simplify the entire calculation to just 4-5 lines of (simple) work! As I shared in my videos concerning parallel lines, we often make calculations more difficult than they need be. This is also true of the way in which we find the equations of lines perpendicular to a given line through some given point. So that students understand that two perpendicular lines will have gradients that are negative reciprocals of each other, we teach them to rearrange a linear equation into the gradient-intercept form first ... and then (often) convert it back to some other form at the end of the process. This 'double conversion' is useful in driving home the principle that perpendicular lines have gradients that are related in that way, but it is terribly wasteful and inefficient if you simply want to find the final equation! In this video I show you how to identify where the gradient's information is 'stored' in a linear equation. I then show you how to use that information to simplify the entire calculation to just 5-6 lines of (simple) work!